The 2012 Stanley Cup Final was the championship series of the National Hockey League (NHL) 2011 – 2012 season, and the culmination of the 2012 Stanley Cup playoffs. This was the 119th year of the Stanley Cup’s presentation. 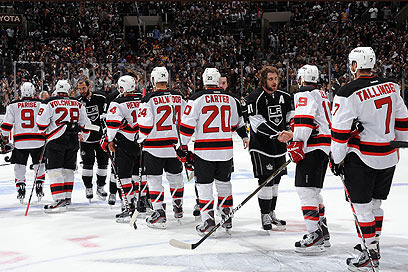 The Western Conference playoff champion Los Angeles Kings defeated the Eastern Conference playoff champion New Jersey Devils four games to two, capturing the first Stanley Cup title in the team’s 45 year history, dealing the Devils just their second Stanley Cup Finals defeat in five tries and first since 2001. Kings goaltender Jonathan Quick was awarded the Conn Smythe Trophy as the Most Valuable Player of the playoffs.